Surface tension is one of the everyday phenomena, like diffusion, which one handles intuitively. One need not think about it unless one wants to understand particular structures, as in cherts and fossils, brought about by the action of surface tension during silicification. Fig.1: Swamp gas bubble squeezed between Trichopherophyton, the bristly plant in the Lower Devonian Rhynie chert, lying prostrate in the swamp. A pointed bristle is seen piercing the surface of the bubble. Apparently both the bubble and the bristle are deformed thereby: not important but instructive. 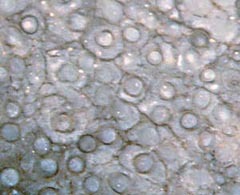 The deformation of the bristle may be due to lengthwise compression as a reaction of the deformed liquid surface and thus serve as fossil evidence for an effect of surface tension other than shaping liquid surfaces. Contrary to an occasionally upheld view, horizontal bands like the one inside the bubble do not indicate the presence of a water level during silicification. The effects of surface tension are commonly known: It tends to shape liquid droplets, soap bubbles, and bubbles within a liquid into spheres. However, the term is not self-explanatory and often misunderstood, even by physicists. What surface tension means can be illustrated by a thought experiment which could be performed in reality as well. Imagine a square frame made of thin wire with a thin sheet of soap water suspended within. (Why soap water is much more suitable than plain water for this purpose would be difficult to explain and is not relevant here. A suspended liquid sheet is easily obtained by dipping the frame in.) The tension of the sheet reveals its presence and its magnitude by pulling the sides of the frame inward or even crushing the frame into a tangle of wire if the wire is very thin. The magnitude of the pull can be measured by applying a force pulling the sides of the frame outward until they are straight again. It is found that the required force is proportional to the side length of the frame, hence the tension of the liquid sheet is reasonably quantified as force per length. Since the liquid sheet has two surfaces, the surface tension of the liquid itself is half the measured tension of the sheet. Another important property of liquid surfaces has been tacity assumed in the above thought experiment: Unlike elastic sheets, whose tension would rise if extended and decrease to zero if left to relax, liquid surfaces retain their tension independent of any change of the area. This means a liquid surface always retains its tendency to reduce its area as much as possible, which makes spherical drops and bubbles if there is no hindrance to taking spherical shapes. In other words: When the air is left out of a balloon, the tension of the rubber relaxes to zero. When the air is slowly left out of a soap bubble through a straw, the surface tension remains the same, (which implies that the pressure inside even increases, as required by the equilibrium of forces). Although the shapes of liquid surfaces can be understood with the notion of surface tension as force per length of surface boundary as proposed above, it is worth mentioning that force per length is equivalent to energy per area in this case. This surface energy is stored in the molecules lying at the surface and thus being less tightly bound to their surroundings than the molecules inside. The energy was put in when the surface was created, and it is available for moving things like pulling the liquid into equilibrium shape or bending the frame. Since the energy per surface area can reasonably be assumed to be a property of the liquid and hence independent of the area, it is obvious that its equivalent, the surface tension, is also independent of the area. The phenomenon of wetting, which is of great practical relevance, is only briefly mentioned here. The physics of wetting can be understood by extending the concept of surface tension to solids and to interfaces between liquids and solids, where the notion of "energy per area" is useful again since "force per length" could not be measured as with liquid surfaces. A combination of the three material properties makes the contact angle, a quantity which can easily be measured. Zero contact angle, as observed with soap water on many solid surfaces, means perfect wetting (which is the very purpose of applying soap). Ideal non-wetting with 180° contact angle can be approached with specially prepared anti-wetting surfaces. 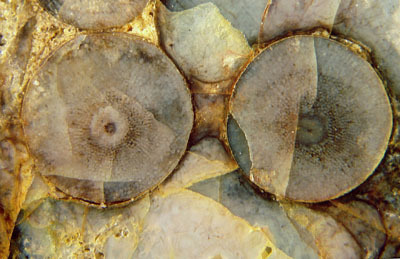 Occasionally it is found that the arrangement of plant parts preserved in chert had been influenced by these manifestations of surface tension. During the earliest stages of silicification, swamp gas bubbles can become trapped in the soft silica gel between the plants. Plant parts can be displaced by the bubbles and fixed in that position. Later, as the gas vanishes by diffusion, the bubbles become filled with water and finally also turn into gel and chalcedony so that the cause of the displacement is not immediately obvious. Fig.3: Rhynia shoots being pushed by swamp gas bubbles below and above, without particular effect in this case. After the cavities had become filled with water, aquatic fungus hyphae grew there before all turned into silica gel and finally into chalcedony. The capillary force is a dangerous force of nature for small creatures. Small creatures need not be careful not to stumble and fall but they must be carefully avoid getting wet lest they be trapped by a drop of water. What is meant by "small" in this connection becomes obvious by looking at water spilled on a table: Small drops come close to a spherical cap, large drops are flat on the top, and none is higher than about 4mm. (A related graphic at Wikipedia is not helpful as it compares 3 drops differing in both volume and contact angle, and the flat top of big drops is not indicated.) This height of about 4mm is a suitable measure for a rough distinction between "small" and "big" in connection with surface tension effects of water. As one plausible but not immediately obvious implication, water cannot form a level in a "small" cavity since its surface is necessarily curved in situations where the pull of surface tension outweighs gravity. 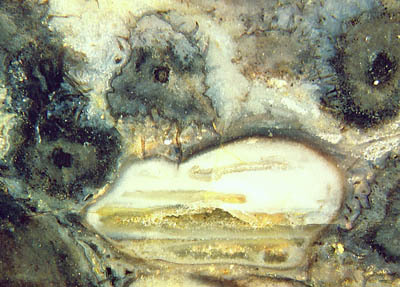 Hence, level bands (really level planes) in the chalcedony fill of small cavities cannot have formed at water levels. The horizontal planes had formed in connection with the plane surface of settled suspensions of silica clusters in water-filled cavities. Fig.3: Level bands in hollow conifer needles had not been water levels. The surface tension of water in half-filled cavities as small as these would force the air into a spherical bubble. Lower Permian chert, Döhlen basin, Germany. Small creatures have developed intricate means of keeping dry, usually a waxy coating making a water contact angle well above 90°, combined with a surface structure with closely spaced small mounds, ridges, bristles, hairs, etc., where the liquid contacts only the tips. This makes an average interface energy which can be much smaller than the local one, which results in an effective contact angle much larger than the local one, which means an anti-wetting effect much better than that of the plain surface. As for spiders and their kin, proper handling of liquids is one of the most important skills. They must be able to handle drops of sticky liquid without soiling themselves when eating. This gives rise to the suspicion that some or even most of the arrays of projections and hairs seen on the mouth parts of some arthropods , usually regarded as filtering devices, might be no such. They might well be efficient means of handling liquid drops and keeping them away from the body parts. Filamentous plants, as pond algae looking like fluffy cotton wool, would be completely flattened when taken out of the water. Nematophytes, the "filamentous plants" now listed among "Enigmatic Organisms" , seem to have invented a particular way of avoiding being crushed by surface tension when their habitat temporarily falls dry: living within a lump of organic gel. Fig.4: Nematophyte: filaments in gel, apparently as a protection against both exsiccation and collapse when out of the water. Rhynie chert, Lower Devonian. with a remarkable filtering device in the mouthparts. Paläontol. Z. 80(2006), 296-306.